The Villa Magna Hotel was the venue last Thursday for the eleventh edition of the PORCELANOSA Grupo Architecture and Interior Design Awards. Located in the Paseo de la Castellana, right in the capital’s nerve centre, this five-star hotel can be found along the Golden mile in Madrid. This is about Classical sophistication being combined with contemporary elegance. The Palacio de Anglada, a private Moorish-themed residence, in which Madrid’s high aristocracy would meet, was many years ago, located in the very same place as the hotel. The Villa Magna Hotel was the main stage for this event, where innovation, architecture and talent became the real focus of attention. 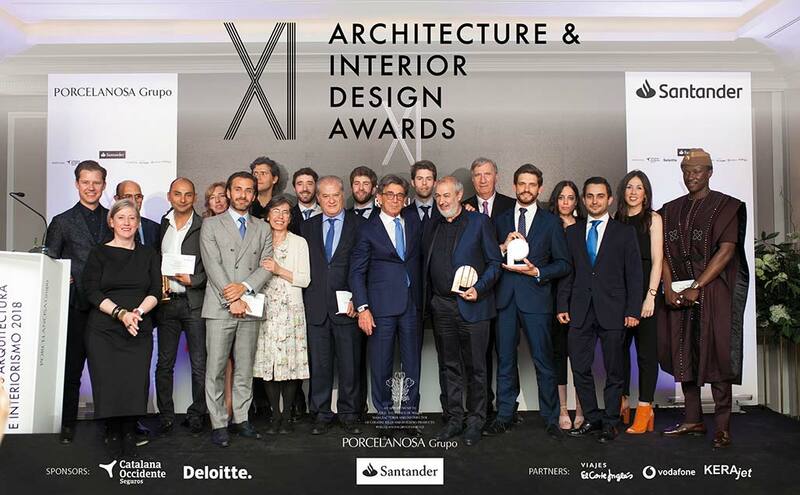 Last Thursday, the PORCELANOSA Grupo Awards were awarded to the most outstanding projects of the year. The award-winning categories were: Students Future Projects; Professional Future Projects; and Finished Projects. In the Projects of the Future – Students category, the prize at the 11 th PORCELANOSA Group Awards went to Luis Orbaiceta, Rubén Aldaba y Santiago de Pablo, students of the BIM Manager Master’s at CICE in Madrid, thanks to his project: The Origami. In the Projects of the Future – Professionals category, the award-winning project was: Watercourse, by Miguel Ángel Mayo, Silvia Díaz, Carmen Córcoles y Borja Cuevas of the Kiga architecture studio. In the Completed Projects category, the winner was Cesar Frías Enciso and Miguel Pradillo of the Morph Estudio architecture studio, thanks to his residential project: Terrazas del Lago. Orchestrated by the presenter and model, Nieves Alvarez, the traditional awards for professional careers and a lifetime’s work were also given. These awards went to the RCR architecture studios, Conran & Partners and Fenwick Iribarren Architects. Among the guests from the Architecture and Interior Design sector, we should mention the presence of Rebecca Jones, Ricardo Mateu, Pierre-Yves Rochon and Rafael Robledo, members of the jury who decided on their respective awards. The 330 and more professionals, clients and celebrities that attended the event had a great evening. There, they could enjoy the menu prepared by the chef, Amalio Prados. All this defined by the exclusive atmosphere that the PORCELANOSA Grupo firm set up in the finest detail.